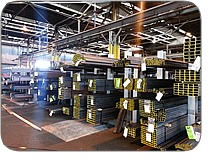 At D-S Pipe & Steel Supply, we represent the premier lines in the industry by supplying over 120 different industrial product lines with a primary focus on structural steel, pipe, weld fittings, groove fittings, gate, globe, butterfly and ball valves. Our huge inventory enables us to immediately pull 95% of all orders and stage them for next day delivery. We work 24 hours a day, 5 days a week to process your orders!! !